WebGoonies.com - Another project to take on..
Another project to take on.. Written on May 16, 2006 by Kevin. My wife recently was given a sewing machine which immediately triggered things in her head. Imagining all the possible things she could sew Rylan, we got some quilting books. Her first attempt at quilting turned out great. 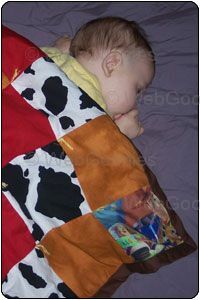 She created a Toy Story themed quilt for Rylan when he gets a bit older and needs something nice to snuggle up with. The Toy Story print was purchased from a craft store and additional fabric was picked to tie into the theme. It certainly turned out great and is already being used for a good game of peekaboo with Rylan. I began my pirate themed quilt the other day as well. This may be one of the most expensive projects we have worked on for Rylan. Fabric is certainly not cheap, especially fabric that is pirate themed. We were unable to find any pirate themed fabric here in town so we took a trip to EBay which happened to have some great choices. Overall, the look of the quilt is nice but certainly is not up to the same quality level as my wife's. I have postponed the finishing of the quilt for now but expect pictures sometime in the near future. I am curious about other peoples experiences. Did you have enough time with your new child to do mini projects such as quilting or redoing a children's table? Are we just really lucky or do people not even do projects for their kids? I am very curious about this. wow, the quilt looks really nice. kudos to mommy for a wonderful job! can't wait to see what daddy's pirate themed quilt is like. i think it's great that you & your wife have found time to do all these little projects for rylan; he's a lucky little boy. i started a scrapbook for my little guy before he was born. i wanted him to have a memory book of his first couple of years here in the states where he was born. then the whole thing got shelved for about two years before i was prodded to work on it again. guess i was busy with other things that come with having a baby...that & catching up on sleep! i wasn't even trying to be ambitious with the pages, but i just couldn't find the time or creative juices to churn out page after page of memories after a while. anyhoo, have done months one to five. only months six to twenty-four to go! Rylan looks like he loves the pretty and well made quilt. I'm jeallous because I can only make horrible looking pillows. BTW: I love the pic of the day...Rylan is giving you a look that says: I want out and once you're not looking I'll get out. Jessica, I was going to add a caption to the photo but decided not to. Definetly looks like he is planning something.